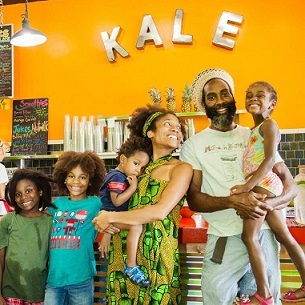 Camille Holder-Brown, co-founder of Kale Café Juice Bar & Vegan Cuisine, is a positively kinetic entrepreneurial force. "Being an entrepreneur is ingrained in you," she said. "You either are or you're not a risk taker and bold person who doesn't mind failing." Kale Café is set to open its third Volusia County location in Port Orange in 2017. However the business started from humble beginnings. "It started when we volunteered at the Mayor's Backpack Giveaway," Holder-Brown explained. "I had been to so many events like that and they always gave out soda and hot dogs which are so unhealthy. I wanted to give back to the community by providing healthy snacks. My husband, Omar, and I brought our own blender and produce and gave away free samples of our smoothies. We loved the experience and thought it was so much fun that we started a nonprofit organization educating people on healthy principles. We kept getting invited to health fairs where people enjoyed our stuff so we decided to sell it at the Farmer's Market." Three years later, the couple has built a growing business with an eye toward franchising the concept. "We would like investors to know we want to franchise," Holder-Brown said. "What separates us is that we use fresh food. We soak beans and crack coconuts every day. Our food seems simple but it's complicated to make." Holder-Brown's advice to aspiring entrepreneurs is that it takes courage, constant hard work and good professional advice. "Be fearless," she said. "You need to work on your business every single day. Get consultants and mentors so you can avoid mistakes. Make sure you set up your business with professional help from accountants and lawyers to ensure you set it up the correct way to maximize the tax breaks and protect yourself. Don't skimp on those kinds of things. Nothing goes the way you plan it. Learn to enjoy the journey and know there's never perfection. It's constant tweaking and adjusting and there's no time you can let your guard down and say you've arrived."